Long Branch — An organization wants to build the only dock in the county dedicated to rowing and manually powered boats by Pleasure Bay Park on Atlantic Avenue. The city appears interested, but issues including the frequent flooding there and if this would affect the ballfields would need to be addressed. Scott Belford outlines plans for a rowing dock off of Pleasure Bay Park. 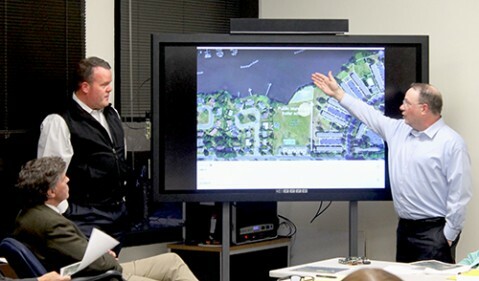 At the March 13 City Council workshop, engineers from T&M Associates said they had been approached by the Monmouth Junior Rowing Center. Scott Belford, from the center, would like to create a place for rowing clubs to practice. “I’ve been part of the sport of rowing for 25 years,” he said. He’s the coach at Christian Brothers Academy, where the program has not only proven popular, but helped many students get into Ivy League colleges. And Belford would like to be able to offer more opportunities for people to get involved. But finding a place to launch is hard. “There’s no public access in Monmouth County for the sport of rowing,” he said. Belford said the rowing club currently uses a yacht club to practice out of. Rowing teams use huge boats — the vessels are often transported in 18 wheelers — which means they need wide docks to launch. The only one in the county is in Rumson, and is only open to residents of that borough. Because of this, in addition to the dock, the club would also like place to store equipment, both for safety sake and because the boats can be expensive. They seek to install two docks in the Atlantic Avenue park, one for the launches and one for “safety launches,” smaller boats to be sent out to monitor the rowers and make sure they’re safe in practice and competitions. The smaller dock might only be accessed from the fenced in storage area, but Belford said the main one wouldn’t be for only crew practice and matches, but open to any vessel powered by hand. “The primary dock… would be available for anyone to launch,” Belford said. “The area we’re at is really uniquely suited for all the man powered sports in the water,” because of the way the water flows in Branchport Creek. Belford sees this as a big potential plus to Long Branch, and the sport of rowing in general. If the club had a place to store equipment, it could offer lessons and classes, as well as places for college students returning home for a break to practice. Rowing is an excellent sport for scholarships, Belford said. Every student on his teams has gotten offers from good colleges, and half of CBA’s graduates who went to Ivy League schools were members of the team. And coaches for college-level teams are currently offering generous scholarships to female athletes from other sports like volleyball because they cannot find enough experienced rowers to fill their roster. The rowing club would pay for the docks – the large one is estimated at about $125,000 – and for the storage and fencing around it. They are asking some things from the city, however. That includes a source of fresh water to wash the boats off, and some lighting for the area. They also say fishing and crabbing would need to be prohibited in the area, since rowers need to be barefoot and they don’t want to deal with broken shells and stepping on bait. They point out there is a fishing location a few hundred feet away which could be used instead. The city wants to discuss the plan further. Mayor John Pallone said that from the city’s point of view, the plan needs to include an opportunity for Long Branch children to get lessons at little or no cost. “That’s a priority,” he said. Stan Dziuba, Director of Public Works, said that there are two major logistics issues. The first is that the planned area for the storage may be too close to the softball fields, which are used by several groups. He’s not sure if it would fit and still allow room to walk from the parking lot to the waterfront. The other issue is flooding. At one time public works tried to put a storage shed in the area. “It floated away,” he said. They had to retrieve it from the river. This means it might not be the ideal place to store expensive rowing equipment.